Benfotiamine, a fat-soluble form of vitamin B1 (thiamine), supports healthy blood sugar metabolism and helps protect the body's tissues against advanced glycation end products and oxidative stress. For example, the enzyme transketolase is critical to blood sugar metabolism. Like many enzymes, transketolase requires a co-factor. In this case, it needs assistance from thiamine. Unfortunately, thiamine is water-soluble, which makes it less available to the interior of the cell. Benfotiamine is fat-soluble and can easily penetrate into the inside of cells. It is also more bioavailable than the water-soluble thiamine. Overall, benfotiamine can activate glucose metabolism and promote healthy blood glucose levels in those already within normal range. It can also reduce formation of advanced glycation end products to prevent glucose toxicity and correct endothelial cell defects caused by high concentrations of blood glucose, especially inside endothelial, retinal, kidney and nerve cells. 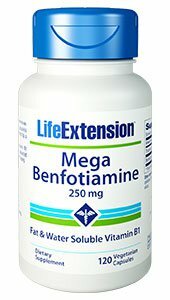 Benfotiamine also helps maintain healthy endothelial function. Benfotiamine with Thiamine is a low-cost dietary supplement that can help maintain blood sugar levels in those already within within normal range and support the health of the nerves, kidneys, eyes, blood vessels, and heart. DIRECTIONS: Take one to four capsule(s) daily with or without food, or as recommended by a healthcare practitioner.